Did you read “The Shadow #0?” It came out in July of last year. To help you deal with the thirteen month gap I will summarize it for you. Harry Houdini helps train the Shadow, and sets him about infiltrating an esoteric secret society dedicated to unraveling Houdini’s illusions. These murderous magicians are hell bent on trying to figure out how Houdini has escaped death itself and try to use Houdini’s wife to convince the Master Magician to reveal the secrets from the afterlife. The Shadow saves the day of course, but the society still looms in darkened allies waiting for their opportunity to unravel the mysteries of the world’s greatest magician. The cult like nature of this secret society is made manifest in the first few pages of this new comic. One of their numbers are dying from old age and he is paid a visit from his cohorts. He agrees that he will try to contact them from the afterlife. Before he dies he draw a random card from a deck, as a means to prove that it is his spirit who will be contacting them later on. Meanwhile, The Shadow is hunting down these rogue magicians to bring them to justice… or at least his version of justice. He manages to garner the details of a séance which will be taking place that evening. The magicians are trying to contact their dead member, but the séance is interrupted by the shadow, showing those in attendance that it is only smoke and mirrors causing the images they see to appear. The cabal scatters, but some still insist that eternal life is obtainable. The issue ends with them murdering one of their own to find out what happens after death. 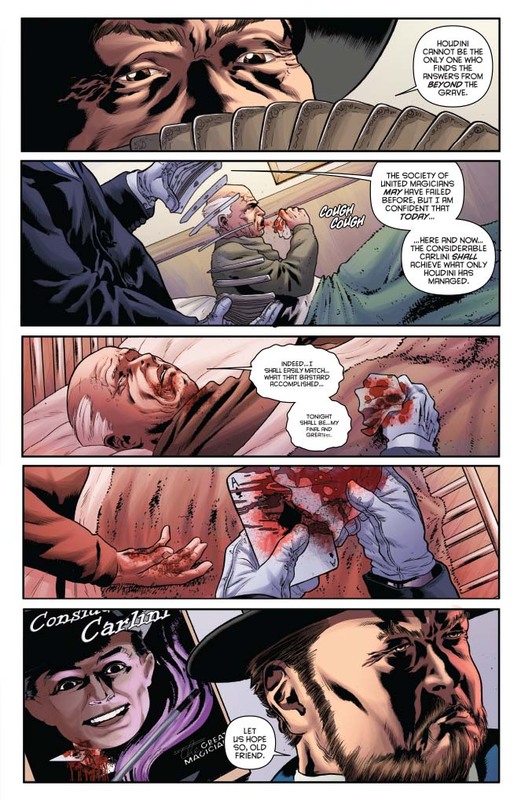 Cullen Bunn has does a fantastic job recreating the world of the early 20th century. Popular culture was absolutely infatuated with the occult and magic during the roaring 20’s. Bunn, in this context, seems to use The Shadow as a litmus test for magic. The Shadow routinely shows what can be construed as the supernatural or sorcery to be really mundane illusions. More than anything, he seems to be displaying the consequences of a murderous mind using parlor tricks to bring about an almost religious zeal to what would normally be seen as a sideshow. The Shadow is the skeptic exposing lies and brining about justice. The art Giovanni Timpano is what elevated this comic to the next level for me. We see a range of characters displayed in this issue: from colorful big top, circus performers to the gun toting Dark Avenger himself. Every panel is expertly drawn with life like details. I almost think Timpano watched someone’s femoral artery bleed out for research; that is how disturbing the ending of this issue is. Should you buy this comic? Yes. It is one dollar! Yes, all the following issues in this ongoing series will be four dollars, but that doesn’t mean you shouldn’t get the first one. Root around in your couch for some change and spend it on this book instead of the pop machine in the office kitchen. You might just find your new pulp favorite.